I was thinking, since there are now quite a few languages (listed in about page) to choose from, I should shed some light on how to select a specific language in the app and how it all works. First off, the default language is English. That means, that if a translation for your native language isn’t available, you will get the app in English. Now, if a translation for your native language exists and as long as your default language in the regional settings in Windows is set, app should be presented to you in your native language. 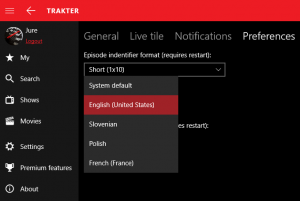 But, I believe there are some of you, me included, who want to see Trakter in English. That is why we’ve added an option, where you can select any other currently available language. But there is a catch. If you open Trakter and go under settings, preferences, language, you can see all other languages, sort of. 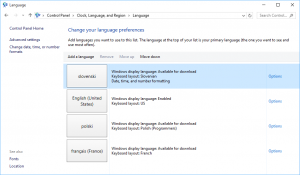 The catch here is, that you can only see languages you have installed under language preferences in Windows. Why? Because resources for each language has to be downloaded from Windows store. OK, for the sole purpose of showing you, I’ve added some other languages in my Windows language preferences. Note: if you add a language, all of your other apps will also download it, of course if it exists. As you can see from the images, I have the same languages in the app as I have in Windows.